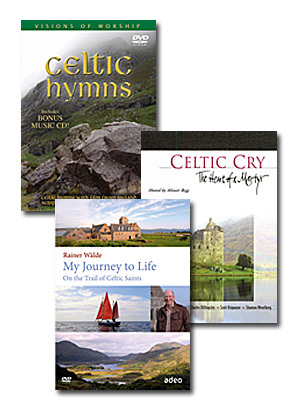 Encounter the beautiful and rich culture of Celtic Christianity as well as the more recent history of the Scottish Covenanters through this set of 3 outstanding DVDs. Discover the rich legacy of the Scottish Covenanters through exquisite photography, narrative and music surrounding their stories. Host Alistair Begg takes us on a journey through the lives -- and deaths -- of these men and women of faith. Taped in Scotland, it includes ten songs from the recording Celtic Cry with singers Matthew Ward, Shannon Wexelberg, Scott Krippayne, and Charles Billingsley. Journey back in time to the origins of Christianity in Ireland and Britain. Travel from Dublin to Lindisfarne. Find out about St. Patrick, Columcille, Brigid, Aiden and Cuthbert. Be inspired by the many ancient prayers, songs and rituals. Discover how a daily rhythm of life -- with set times for solitude and for Christian Communion --benefit our spiritual well-being. Explore how a spiritual life following the course of nature and admiring creation can help us to draw near to God.